Brown bacon in a medium skillet over medium high heat. Remove bacon to a paper towel lined plate. Add 2 tablespoons of butter to the bacon grease in the pan and let it melt, 1 turn. Add onions to the pan and saute 1 to 2 minutes. 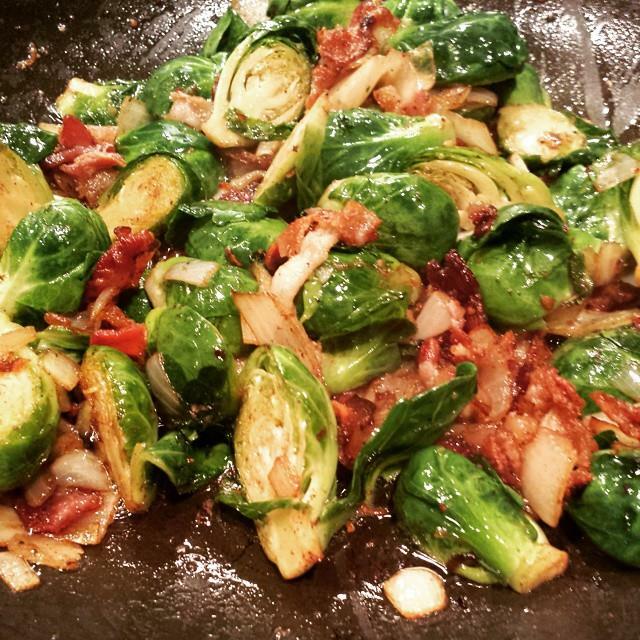 Cook Brussels sprouts 2 to 3 minutes or until they begin to brown. Chop up your bacon and add it back to the pan for 3 to 5 minutes. Transfer sprouts to a serving dish with a slotted spoon and top with parmesan cheese.